Having served individual veterans since 2003, Horse Sense began formally working with veterans' organizations and groups in 2012, specializing in issues of PTSD & Trauma, addiction, anger management and depression/anxiety. Fall-In Fridays will be held EVERY Friday April through June and then the FIRST Friday of each month thereafter through December, for veterans, active duty and first responders to learn about services available. July 5, Aug 2, Sept 6, Oct 4, Nov 1, and Dec 6. Plug in to all our events and stay updated on new offerings through our Facebook page (Veterans Horseplay WNC). According to the Journal of the American Medical Association, Equine Therapy / Animal-assisted Therapy "has shown to be effective in treating patients, including combat veterans, with PTSD, depression, anxiety, attention-deficit/hyperactivity disorder, conduct disorders and other chronic mental illnesses." Many services for veterans & first responders available at no cost. 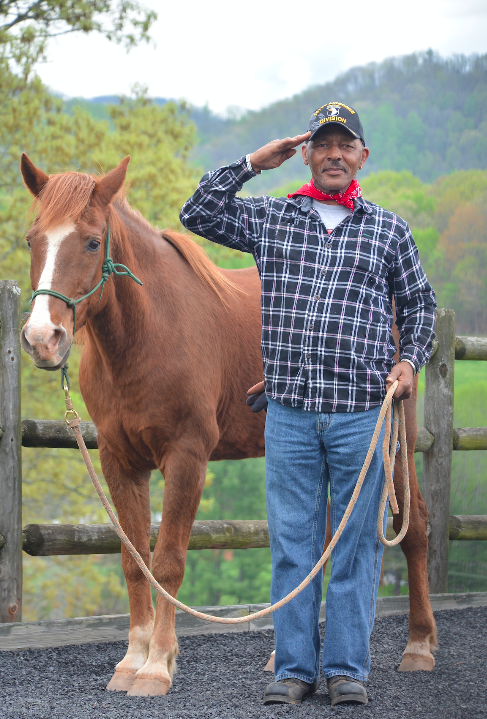 We are pleased to offer programs for veterans throughout Western North Carolina through the support of Heart of Horse Sense, a 501c3 that fundraises to support equine therapy for veterans, their families, and at-risk youth. Horses are the original “trauma brain,” wired less for well-thought out responses than for quick reactions to stimulus and potential threat: it’s how they have survived for centuries in the wild. They, like humans, have fight-flight-freeze impulses in the face of danger. Horse psychology and the horse’s brain structure is built first and foremost for survival in a rough, predator-heavy world. The pathways of the brain that say “Run first and ask questions later” are the strongest, with neural pathways for survival that look like super-highways rather than dirt roads. And yet, horses are part of the fabric of daily life for many, incorporated into all kinds of regular activities for people, from high-level Olympic competition to multi-million dollar racing operations, to scenic trail rides and backyard ponies. They are doing it with grace and ease that belies their “prey animal” status. How do horses–prey animals–learn to live and thrive in the midst of the human predator world? The answer is it’s not easy to be a horse in human-ville. It takes time, flexibility and repetition. And it’s not easy to be a Veteran in a civilian world. Adaption takes time. Horse Sense of the Carolinas has been providing Equine Assisted Psychotherapy & Learning services in Western North Carolina for more than a decade. We are the oldest, most experienced and most professional dedicated Equine Assisted Practice in WNC. Horse Sense staff are EAGALA-certified, Trauma-Focused Equine Assisted Psychotherapy trained & certified, and have staff with thousands of client-contact hours in Equine Assisted Psychotherapy, having served more than 1500 veterans through the years! Horse Sense enjoys being a leader in the field and the standard by which other Equine Assisted Practices are gauged. We are routinely sought after for presentations and trainings all over the world by and for other Equine Assisted Professionals, offering continuing education credits for EAGALA, PATH International, and other Equine-Assisted certifying organizations.